James D. Schultz, who was an associate White House counsel for President Trump, will head the government and regulatory practice for the Philadelphia-based law firm Cozen O’Connor. 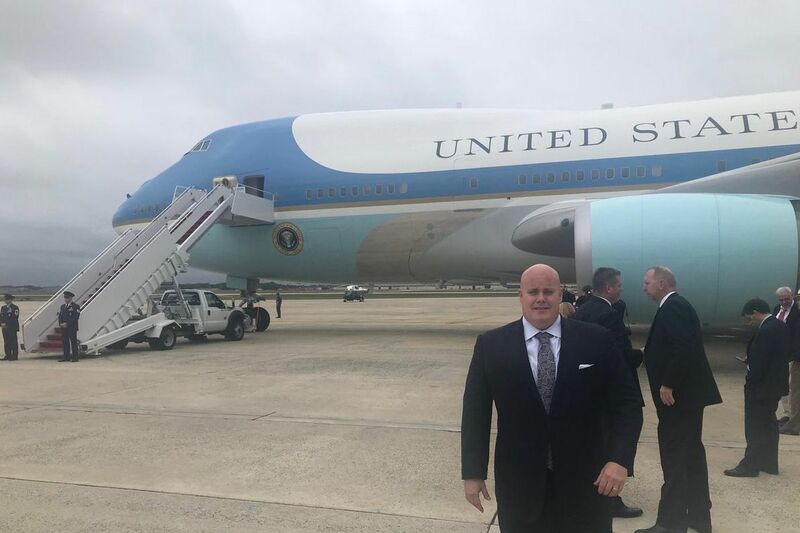 Jim Schultz, recent White House ethics lawyer and former walk-on offensive lineman for the Temple Owls (1992-93), has had his share of public service and political work with, let's say, interesting public figures. This includes a policy job with U.S. Rep. Pat Meehan when Meehan was U.S. Attorney in Pennsylvania's Eastern District; work on the 2004 George W. Bush reelection campaign; serving as general counsel (top lawyer) to Gov. Tom Corbett during what was often a rocky one-term tenure; signing up with New Jersey Gov. Chris Christie's 2016 presidential campaign, then working for Donald Trump (once Christie dropped out), including during the Republican National Convention, later during Trump's transition into the White House and, finally, on the White House staff. In between and among some of this, Schultz did stints at Philly powerhouse law firm Cozen O'Connor. He went to the White House last January as part of Trump's legal team, focusing on financial disclosure and divestiture issues of presidential appointees. Schultz, 45, was born in Atlantic City and grew up in Galloway, N.J. His dad ran an upholstery business. His mom was a homemaker. He went to Gettysburg College, where he played football before transferring to Temple, where he also played football. He got his law degree from Widener University. Schultz is married and lives in Philadelphia. His wife, Michelle Schultz, is deputy general counsel at SEPTA. They have two young daughters. Last month, he left the White House to return to Cozen O'Connor. Headlines noting his departure (perhaps understandably) raised some eyebrows. Columnist John Baer recently interviewed Schultz. Your resignation, which played out in media as "ethics lawyer quits Trump White House," brought you a sudden rush of attention. How'd you like dealing with "fake news?" Well, I did resign. That's not "fake news." And the media reported accurately on what I said. I had worked on the transition as legal counsel and then was offered a dream job, the White House counsel's office. The interaction of government, politics, and law, for me that's the Super Bowl. But I said from the beginning I'd stay for about a year. That was understood going in. But you're right, media reaction was pretty surprising. I expected some local coverage. Hometown lawyer in Washington. But there was coverage in The Hill, Politico, CNN. I was asked to do some national news shows. And that was fine. I don't have any problem talking to news media. Still, do you believe the news is "fake"? Do you believe the president does? I think it's the obligation of the news media to ask questions. You held my feet to the fire in Harrisburg. And by and large, reporters I've dealt with I've gotten a fair shake from. Naturally, there's movement toward rushing to stories, and you get inaccuracies, intended or not, I don't know. But there's a clear intent of certain news outlets to favor the left or the right. And the president has actually stated there have been inaccuracies. He's held media accountable in a way no other public figure has. Can you cite an example of that? Hmmm (long pause) … I think the slant of the stories about the administration are, a lot of the time, in this case, they seem to be lined up against him on the left. How much interaction did you have with the president, and where was your office? Not a whole lot. By and large, the president is briefed by senior staff. That's General Counsel Don McGahn. I was senior associate counsel located in the Executive Office Building next to the White House. Don is in the West Wing. But in the White House and during the campaign, I had interaction with the president. He has a good sense of humor. Demanding boss. Decisive by nature. Clearly not a politician. But makes decisions like a CEO would. Do you see the irony in the fact that your duties included reviewing financial disclosure, conflicts of interests, divestitures, some of the very areas the president and members of his family have been criticized for? Well, the president is excluded by law. That's why he hired Fred Fielding (White House counsel to Presidents Ronald Reagan and George W. Bush, associate counsel to President Richard Nixon) to separate him from his assets and involvement in his business. That was fully vetted. And the president's son-in-law and daughter went through the same process everybody else did in terms of financial disclosure, which was certified by the White House Counsel's office and the Office of Government Ethics. What can you tell me about Russia? I'm not talking about Russia. What was the most significant or controversial thing you handled? With the level of people the president attracted from the business sector, we had more and more folks with such high levels of success that it made financial disclosure efforts more and more onerous. It made the job complicated, a much more difficult task than dealing with someone who, say, was a long-time government bureaucrat. He brought in job creators. So, that was a challenge. As to the most significant, I'd say judicial appointments. As of now, do you see that as this president's legacy? And other things: deregulation, tax reform, hopefully health care. But, yeah, especially appointing tremendously qualified judges who respect the rule of law. Originalists who believe the text of the Constitution is what matters. That's the focus of putting judges on the bench as a check against executive or legislative overreach. It's vitally important to protect government. And as a lawyer, it's a fascinating thing to be able to impact the judiciary on such a vast level: 18 circuit judges appointed, eight confirmed; 40 district judges appointed, four confirmed. And of course, one Supreme Court justice (Neil Gorsuch) confirmed. What was the best and worst parts of the gig? When I started as counsel to Gov. Corbett, overseeing hundreds of attorneys in the state agencies, there was an operation in place with a lot of career employees. Starting in the White House counsel's office, we had to start from scratch. There are 25 lawyers. There were no office supplies, no legal pads, no staff. There were 10-, 12-, 18-hour days, a lot of early mornings, a lot of late nights. But the best part was walking into the West Wing and the Executive Office every day, working for the people of the country to improve their lives. It's quite an honor. A privilege. It's a hard job to leave. What will you be doing back at Cozen, and where? I'll be chairing the firm's government and regulatory practice, working out of Philadelphia and Washington, sometimes Harrisburg. Areas including energy, transportation, technology, health care, trade. No lobbying (there's a five-year ban). I was never a lobbyist. Would you go back to public service? I don't know. I thoroughly enjoyed my time at the White House. Now I want to focus on building my law practice and returning to my life in the city of Philadelphia. But if I got the call to do something interesting, sure, I'd consider it. But I'm not looking for it.